The common denominator among varieties of insulation is the R-value. At the technical level, R-value is a measure of resistance to heat flow through a given thickness of material. This value is given for thicknesses of “material” such as insulation or windows. It does not apply to a completed product such as a hot tub or a refrigerator. There may be an R value of the insulation in each of these products but NOT an overall R value of the product. Any claim of an R value associated with a complete hot tub is a hoax, an R value of the insulation used in the hot tub can be claimed. A high R value of the insulation used is a mute point if there is a loose fitting cabinet or a poor quality cover or a sub-standard floor allowing heat to escape. No different than a home with thick insulation in the walls with poor fitting windows and doors allowing heat to escape. Foam-Filled vs. Recycled Air Space? Foam filled insulating has been found to be the least effective method of insulating a hot tub or swim spa. It is extremely expensive to fix any issues that your unit may have. Ask any service tech out there about the hours they will need to spend scraping a pile of foam out and even having to stand the spa upright to access things from the bottom. This is a huge negative for that type of insulation, also to find where a potential leak is coming from, you may see it on one side of the hot tub/swim spa when it is actually starting in a completely different area. You must then really buy into the fact that you will save a bundle on electricity if you fully foam the spa, but this debate has been going on for over 20 years and the full foamers have yet to produce unbiased test results that prove it. If it were the undisputed superior way of building spas, everybody would be doing it that way. It is highly recommended to stay away from foam filled hot tubs/swim spas. Non-foam filled insulated hot tubs and swim spas are much easier to service, however there is a difference between the two processes. The first, while effective, leaves your plumbing and the underside of the hot tub uninsulated. What does this mean? It means that these areas are exposed to the cold climate and have no way of trapping the heat from the underside of your unit. This way of insulating is very inexpensive, and inefficient, for the manufacturers; beware of mass produced and low cost hot tubs and swim spas using this method. The second non-foam filled method of insulating a hot tub or swim spa is the most cost and energy efficient type of insulating. When the cabinet and the base of the hot tub/swim spa is insulated it allows all of the heat coming from the pumps to be re-circulated in the cavity keeping the air around the unit warm and less effected by the outside temperature. The additional spray foam on the shell helps to keep the water warm. Using both types of insulation allows your hot tub/swim spa to work at peak performance without over-working causing your bills to rise in the winter. This type of hot tub/swim spa insulating also allows for very simple access to your hot tub/swim spas plumbing and pumps which results in quick and inexpensive service calls. This method is the best method of insulating, it is very cost effective and efficient. 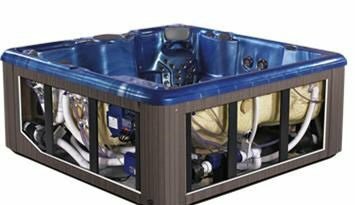 PDC Spas manufactures their hot tubs and swim spas using this method with their exclusive TemperLok™ insulation design, economical performance and efficient, quick servicing. What is the CEC Testing? Testing? It is important to note that lately, more and more manufacturers are indeed doing electrical consumption testing behind closed doors for their own internal marketing/sales programs. Legitimate manufacturers are assuring their spas meet or exceed the requirements set forth by the California Energy Commission. That is good for consumers, because you don’t have to really question the insulation effectiveness of one brand of spa to another as long is made by a reputable manufacturer who has completed and passed this testing for the CEC. PDC Spas has completed their full line-up in compliance with the CEC, and tested up to 33% more efficient than the industry standard. A common question for new hot tub buyers and a difficult one to answer honestly. Much like being asked “how much fuel will I use in this new truck?”. There are variables like kilowatt cost in your region, how often you use your spa, how warm you like it, what the outside temp is and are you using a high quality cover? Any brand that claims an amount, read the fine print and determine where you fit in, and be sure to buy a well insulated unit from a quality manufacturer. PDC Spas has been building hot tubs for nearly 30 years and history has proven an average of about a dollar a day.